Tasty Tuesdays are back! The Linden Life: Tasty Tuesdays are back! I kind of failed on my 'Tasty Tuesdays'. I made soup on the First Week, a Turkey on Week Two, and then I took a little break. 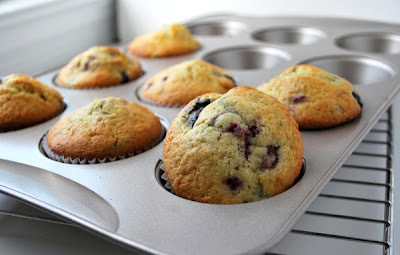 So here I am, back bright and early with Berry Muffins! Basically, I wanted to make muffins but did not have any of the usual muffin ingredients on hand. Most recipes call for plain yogurt, which I didn't have. A lot of recipes call for bananas, which I also didn't have. I thought I might be able to whip up something with carrots, but unfortunately I was out of carrots too! So, here is the recipe I came up with, which I think turned out pretty well. Mix the dry ingredients together. Add the frozen berries. Mix the wet ingredients together and slowly fold into the dry mixture. Mix until just combined. Divide batter into 12 muffin cups, and bake at 375ºF for 20-25 minutes, until tops are golden brown. That's it! I like to make muffins at the beginning of the week, and put them in the freezer. When Tyler or I are heading to work, we grab one from the freezer to add to our lunch (or breakfast). By the time we're at work and hungry, the muffins are thawed and ready to eat.